I grew up in Virginia, and all the summers of my childhood, I smelled the intoxicating scent of gardenias wafting through our home. My grandmother planted gardenia bushes close to the house: north, south, east and west. At night, when the windows were open, I could smell the heavy aroma of gardenias in almost every room, upstairs and down. Even the “industrial-strength” metal fan I always had blowing at full speed in my direction (an excellent mosquito deterrent) could not disperse the smell of gardenia. Since leaving home, I’ve always had gardenia plants wherever I’ve lived: in balmy L.A. and here in the Pacific Northwest. In Seattle, I have my gardenias in pots I can move — in summer I can bring them under my bedroom window, in winter they can be rushed into the garage when a cold spell hits town. Let’s call me a Gardenian. I was excited to try Arquiste Boutonnière no. 7* (with its touted “gardenia jasminoides” — the gardenia most people are familiar with — and “gardenia citriodora”). I have never smelled a perfume (or soap, or candle…) that captures the true, complex scent of gardenia (I somehow missed Tom Ford Velvet Gardenia that everyone raves about), but I always hope for a miracle. Arquiste Boutonnière no. 7 opens with a burst of fleshy white flowers (not gardenia, but jasmine); the flowers are sweet, mildly indolic and have an undercurrent of woodiness. As the fragrance quickly develops, I detect a soft “orange peel” note, a gentle touch of “smoke” (the vetiver?) and oak moss. Arquiste Boutonnière no. 7 plays nicely on skin: after I sprayed the fragrance on, I detected indoles on my left hand, orange peel on my right hand, and vetiver and flowers on my wrists; this fragmentation makes for an interesting experience, and all the perfume’s notes work together to create a “happy,” sunny, summertime vibe. Boutonnière no. 7 dries down to a “fresh” (but creamy) white floral and smooth vetiver perfume. Arquiste Boutonnière no. 7 can easily be worn by women, but how will men take to a jasmine/“gardenia” fragrance? (I’m betting, without any evidence, that women will buy this fragrance more than men.) Arquiste Boutonnière no. 7 contains excellent ingredients, has good lasting power, discreet sillage, and it does not smell old-fashioned (as its inspiration, “May 1899, Foyer of the Opéra-Comique, Paris,” could lead you to believe). As for me…the gardenia perfume I’ve been waiting for has not yet arrived. Arquiste Boutonnière no. 7 Eau de Parfum is $195 for 55 ml (this price includes a M. de PHOCAS ‘gardenia’ stick-pin/boutonniere and knotted-silk cufflinks). For buying information, see the listing for Arquiste under Perfume Houses. *Perfumer: Rodrigo Flores-Roux; listed notes of bergamot, lavender, mandarin, gardenia jasminoides, gardenia citriodora, genet absolute, vetiver, oak moss. This one is on top of my to-sniff list, as it seems an intelligent and complex interpretation of white flowers. I have never encountered a real gardenia, so will not be devastated if it doesn’t smell like the real thing. Unfortunately, it’s really difficult to aquire a sample of this here on the North-Eastern edge of Europe. So I have ordered a sample of Aleksandr instead to keep me company until No. 7 becomes obtainable. Thanks for the review! Annikky: hope you get to sniff this soon. I also adore the scent of gardenias, the rare floral smell I like. Have you smelled Crepe Gardenia put out by Gap many years ago? I have always thought it was one of the best “pure” gardenia scents. Gap did rollerballs only in about 6 frags, this was the best IMHO. K.R. : I think the only Gap scent I ever tried was an “incense”…certainly not the gardenia one…. You won’t hear me raving about Velvet Gardenia. I am keen to try the Arquiste, though, to my mind, the best gardenia scent I’ve sampled has been the sadly discontinued Yves Rocher. Still not as heavenly as real life. fragrantfoodie: I’ve always felt left out with that “black gardenia” of Tom Ford’s. I’ve noticed that people rave about it even more when they find out I’ve never smelled it. HA! I love real gardenias, and have several large bushes at my house, but prefer not to wear them. The closest I’ve found to a real gardenia perfume was Terra Nova’s Gardenia oil. It was one of my cheap thrills, perfectly capturing the green leaves and dewey leaves. Perfect Gardenia by SHP is close, but not enough indoles and the drydown is way woody/powdery. The beginning is beautiful though. Smokey: yep…gardenia, magnolia and water lily/lotus…never am satisfied with the perfume versions. A floral vetiver – this sounds great to me! I was sure I’d love Guerlain Vetiver pour Elle, but its gigantic (to my nose) white musk overwhelmed everything else. Not seeing any white musk in the list of notes above, so I’m hopeful! I don’t get on with gardenia perfumes so this actually sounds really nice. Shame about such limited distribution *sigh* Must try and move out of the sticks soon! I wish I could grow gardenias. It’s too cold here and I don’t have a sunny enough window to put one in. I’ve tried numerous times but those plants are more to take care of than most pets. I’ve given up and I’m content to get my fix in perfumes now. I don’t have a favorite but I’m not that fussy with this note. As long as it reminds me of gardenia I’m happy. Hi, Poodle: Have your tried a gardenia that’s labeled “winter hardy”? Maybe something like “Gardenia jasminoides ‘Kleim’s Hardy'” (no affiliation) would work for you? I have a mini-sample of that Tom Ford Velvet Gardenia that I haven’t gotten around to trying yet. I do like gardenias a lot but I think they can smell really old-fashioned and blah in perfumery. I rather enjoyed Jo Loves Gardenia, have you tried that one? Anyway would really love to try this but with the deluge of things coming out, who knows if I ever will? Arquiste doesn’t have distribution near me. Oh, and Andy Tauer plans to release a gardenia-based scent in late 2013, I think. Looking forward to that. Keven, I adore gardenias and just like you, I grew up with large gadenia bushes in the garden of my family home. I’ve searched for the perfect gardenia perfume that captures its scent and found the journey interesting, but came out with very little. One of them is by Jo Loves and the other is Kai. They come pretty close to the real gardenia in my opinion. Andy Tauer is supposed to be releasing a gardenia perfume this year and I am so looking forward to that. To me, TF’s Velvet Gardenia was a bit of a disappointment in that it was too fruity and aminalic. I was also disappointed by Jardenia. It smells like gorgonzola. Not something I’d like to smell on me or on anyone else! Lady M: cheese, the Final Frontier in perfume! I too have been on the hunt for a Gardenia perfume and have tried many but none with satisfaction. 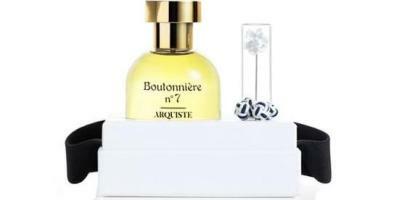 I tried Arquiste’s Boutonniere No.7 last week in great anticipation. I liked it but found it to have a rather green/vetiver twist compared to what I recall gardenia smelling like. Unfortunately I do not have a gardenia plant to help compare the authenticity so I was glad to read your review. I wanted your opinion on “Gardenia’ by Penhaligon’s. Does it come any closer?